Greg Sarris has been involved in a number of creative projects from many different disciplines. Use the links below to navigate to the section you wish to view. In the tradition of Calvino’s Italian Folktales, Greg Sarris, author of the award-winning novel Grand Avenue, turns his attention to his ancestral homeland of Sonoma Mountain in Northern California. In sixteen interconnected original stories, the twin crows Question Woman and Answer Woman take us through a world unlike yet oddly reminiscent of our own: one which blooms bright with poppies, lupines, and clover; one in which Waterbug kidnaps an entire creek; in which songs have the power to enchant; in which Rain is a beautiful woman who keeps people’s memories in stones. Inspired by traditional Coast Miwok and Southern Pomo creation tales, these stories are timeless in their wisdom and beauty, and because of this timelessness their messages are vital and immediate. The figures in these stories ponder the meaning of leadership, of their place within the landscape and their community. In these stories we find a model for how we can all come home again. 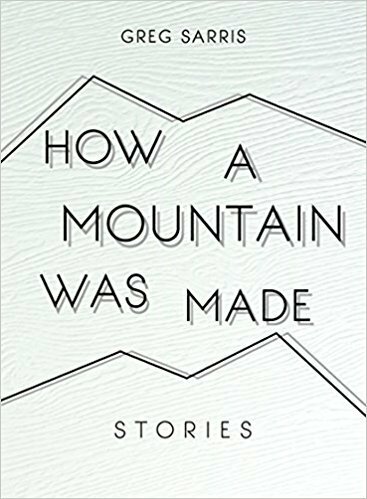 At once ancient and contemporary, How a Mountain Was Made is equally at home in modern letters as the ancient story cycle. 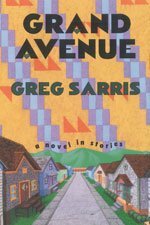 Sarris infuses his stories with a prose stylist’s creativity and inventiveness, moving American Indian literature in a new and emergent direction. 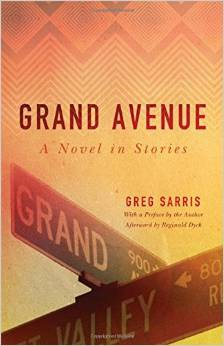 A reissued edition of Greg Sarris’ widely acclaimed short story collection, Grand Avenue, American Indian Literature and Case Studies. Grand Avenue runs through the center of the Northern California town of Santa Rosa. One stretch of it is home not only to Pomo Indians making a life outside the reservation but also to Mexicans, blacks, and some Portuguese, all trying to find their way among the many obstacles in their turbulent world. 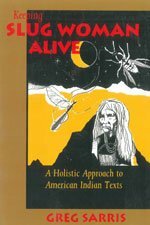 Bound together by a lone ancestor, the lives of the American Indians form the core of these stories—tales of healing cures, poison, family rituals, and a humor that allows the inhabitants of Grand Avenue to see their own foibles with a saving grace. A teenage girl falls in love with a crippled horse marked for slaughter. An aging healer summons her strength for one final song. A father seeks a bond with his illegitimate son. A mother searches for the power to care for her cancer-stricken daughter’s spirit. Here is a tapestry of lives rendered with the color, wisdom, and a quest for meaning that are characteristic of the traditional storytelling in which they are rooted, a tradition Sarris grew up hearing and learning. Vibrant with the emotions and realities of a changing world, these narratives—the basis of an HBO miniseries—are all equally stunning and from the heart. In a powerful follow-up to his widely acclaimed short story collection, Grand Avenue, Tribal Chairman Greg Sarris tells a tale about the love and forgiveness that keep a modern American Indian family together. Told from the points of view of a twenty-year-old Pomo Indian named Johnny Severe, his grandmother, Elba, and his mother, Iris, Watermelon Nights uncovers the secrets behind each of these characters’ extraordinary powers of perception. Johnny is trying to organize the remaining members of his displaced tribe; at the same time he contemplates leaving his grandmother’s home for the big city. As the novel shifts perspective, tracing the controversial history of the tribe, we learn how the tragic events of Elba’s childhood, as well as Iris’s attempts to separate herself from her cultural roots, make Johnny’s dilemma all the more difficult. 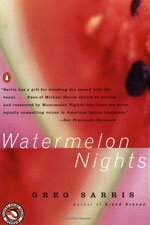 Gritty, yet rich in detail and emotion, Watermelon Nights stands beside the novels of Louise Erdrich, Michael Dorris, and Sherman Alexie as an important work, not only in Native American literature, but in contemporary American fiction. A Los Angeles Times Bestseller! Greg Sarris‘ first work of fiction, a novel in 10 interconnected stories, probes the disenfranchised lives of a Native American community in California. Grand Avenue, a street in the center of the northern California town of Santa Rosa where “everybody’s connected to everybody,” is home not only to Pomo Indians making a life outside of the reservation, but also to Mexicans, blacks, and some Portuguese, all trying to find their way among the many obstacles in their turbulent world. Bound together by a lone ancestor, the lives of the Native Americans form the core of these stories – tales full of cures, poison, family healing rituals, and a kind of humor that allows the inhabitants of Grand Avenue to see their own foibles with a saving grace. A teenage girl falls in love with a crippled horse marked for slaughter . . . an aging healer summons his strength for one final song . . . a father seeks a bond with his illegitimate son . . . a mother searches for the power to care for her cancer-stricken daughter’s spirit. Here is a tapestry of lives rendered with the color, wisdom, and quest for meaning of the traditional tale-telling in which they are rooted. Vibrant with the emotions and realities of a changing world, these stories are all equally stunning and from the heart. A world-renowned Pomo basket weaver and medicine woman, Mabel McKay expressed her genius through her celebrated baskets, her Dreams, her cures, and the stories with which she kept her culture alive. She spent her life teaching others how the spirit speaks through the Dream, how the spirit heals, and how the spirit demands to be heard. Greg Sarris weaves together stories from Mabel McKay’s life with an account of how he tried, and she resisted, telling her story straight–the white people’s way. Sarris, an Indian of mixed-blood heritage, finds his own story in his search for Mabel McKay’s. 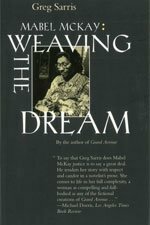 Beautifully narrated, Weaving the Dream initiates the reader into Pomo culture and demonstrates how a woman who worked most of her life in a cannery could become a great healer and an artist whose baskets were collected by the Smithsonian. Hearing Mabel McKay’s life story, we see that distinctions between material and spiritual, and between mundane and magical, disappear. What remains is a timeless way of healing, of making art, and of being in the world. 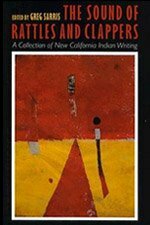 In this anthology of poetry and fiction, ten Native Americans of California Indian ancestry illuminate aspects of their respective native cultures in works characterized by a profound love of place and people, as well as by anger over political oppression and social problems. This remarkable collection of eight essays offers a rare perspective on the issue of cross-cultural communication. Greg Sarris is concerned with American Indian texts, both oral and written, as well as with other American Indian cultural phenomena such as basketry and religion. His essays cover a range of topics that include orality, art, literary criticism, and pedagogy, and demonstrate that people can see more than just “what things seem to be.” Throughout, he asks: How can we read across cultures so as to encourage communication rather than to close it down? Sarris maintains that cultural practices can be understood only in their living, changing contexts. Central to his approach is an understanding of storytelling, a practice that embodies all the indeterminateness, structural looseness, multivalence, and richness of culture itself. He describes encounters between his Indian aunts and Euro-American students, and the challenge of reading in a reservation classroom. He brings the reports of earlier ethnographers out of museums and into the light of contemporary literary and anthropological theory. Sarris’ perspective is exceptional: son of a Coast Miwok/Pomo father and a Jewish mother, he was raised by Mabel McKay–a renowned Cache Creek Pomo basket weaver and medicine woman–and by others, Indian and non-Indian, in Santa Rosa, California. Educated at Stanford, he is now a university professor and recently became Chairman of the Federated Coast Miwok tribe. His own story is woven into these essays and provides valuable insights for anyone interested in cross-cultural communication, including educators, theorists of language and culture, and general readers. Visit Greg Sarris’ IMDB page. An HBO Original Series written and produced by Greg Sarris, executive producer Robert Redford. Based on the book by Greg Sarris, teleplay by Greg Sarris. Nominated for a prime time Emmy for Best Casting. Winner of the Golden Apple Award from the National Educational Media Network. Winner of the Best Feature Film award at the American Indian Film Festival. After her boyfriend, Jack dies on his reservation, Mollie is asked by tribe members to leave the reservation for not being one of their own. With a heavy heart, Mollie is forced to pack her children, belongings and memories and move to northern California, right into a gang infested neighborhood. “How A Mountain Was Made”, Greg’s children’s stories, to be published soon under the title “How A Mountain Was Made” were recently performed in 2012 by the Word for Word Performing Arts Company at Z Space in San Francisco. Greg Sarris has also written plays for Pieces of the Quilt, Intersection Theatre, and the Mark Taper Forum. A play written by Greg Sarris. Opened at the Intersection Theatre in San Francisco, February, 2002. Received the 2003 Bay Area Theatre Critics Award for Best Script. HBO Miniseries. Her name was Maria, which was what the priest at St. Rose Church called all of the Indian girls, even this girl Maria Evangeliste, who ironed his vestments and each Sunday played the violin so beautifully as the communicants marched to the altar to receive the sacraments that Jesus was said to smile down from the rafters at the dispensation of his body and blood. Mabel McKay, renowned Pomo basket weaver and doctor, she told me about this, too. Spring. “Coming out time,” she said. Which was how the season was described, quite literally, by many Native California cultures…. Something about the glare of noon. Or nearabouts noon because summertime that hour feels like eternity, the essence of the season itself, halfway between here and there, stopped. Something about the stillness of light, and the motionless surface of the green river. On a dry path above the water even the orange-flowering monkey plant and sticky-leafed mountain balm appear to be waiting, as if for the sun to move again. Until an osprey breaks out of the sky, silver body and black-tipped wings, coursing the snaking path of the river. Mrs. Ianucci, the babysitter, had a scar that, as I remember it, resembled in shape and dimension the continent of South America. She had stepped into her backyard, no doubt hearing dogs bark, to see what was going on, and had thought in her haste only to button the top button of her sleeveless blouse, and there it was, emblazoned like a tattoo atop her protruding hard stomach, the purple scar. Behind her the canopy of a weeping willow fell like a curtain. It was morning. In the bright light she looked as if she were on a stage, alone and there for me to see. Her Indian name, or at least one of her Indian names, the only one any of us know, was Tsupu. She was my great-great-grandfather’s mother, or my great-great-great grandmother, and, again as far as any of us know, the last native of Petaluma, not the city we know today, but the ancient Coast Miwok village of the same name. Certainly, she was the last to pass down any memory of the place. She was quite young, perhaps fourteen, when she left, beginning what would become a chaotic, wholly incredible journey to find and keep a home in and about Sonoma County. She was looking at the very dry, late September hills near Highway 80, just east of Fairfield. We were on our way back to the Rumsey Wintun Reservation, where Mabel was living at the time, after she’d given a talk to several students and faculty at Stanford University about her doctoring and basket weaving. A little over a month ago, on December 15, while driving from my home on Sonoma Mountain to San Rafael, where a gala was scheduled at the reconstituted San Rafael Mission, now a cathedral, celebrating the mission’s 190th anniversary, I found myself thinking, not of my planned keynote address, but of a Coast Miwok boy in jail. In addition to operating as the primary advisor and Chairman of The Federated Indians of the Graton Rancheria, Greg Sarris has also written and developed stories for children. Greg Sarris’ collection of stories are inspired by the creation of Coast Miwok & Southern Pomo, the sacred site of Sonoma Mountains, the plain of Santa Rosa, Copeland Creek. Children will delight in wonderful stories about Coyote, Warm Wind, Centipede, Lizard & Frog Woman and more. Read How a Mountain Was Made by Tribal Chairman Greg Sarris. This inspirational story provides motivation and inspiration. In an effort to restore and rebuild, Greg Sarris has a passion for changing lives and and creating a strong impact within the Graton Rancheria Tribe and surrounding neighborhoods. Read articles and speeches about Greg’s dedication to make a positive impact in the community here. The 37th Annual California Conference on American Indian Education (CCAIE) is being held March 16-18, 2014, at the Hyatt Vineyard Creek Hotel & Spa in Santa Rosa, CA. When the first jackpot hits at the new Graton Resort and Casino in Rohnert Park later this fall, there’ll be more than just one winner. Learn about Southern Pomo Heritage through Greg Sarris’s speech at the Sebastopol Community Center. Greg speaks of the connection between Southern Pomo and the Federated Indians of Graton Rancheria. A relative told me that when she saw Tom’s Smith’s charmstone, she was temporarily blinded and felt instantly faint-its power was that overwhelming. The charmstone, an oblong, smoothly carved rock figure, about an inch and a half in length, was loosed from Tom Smith’s “doctoring kit,” which had been stored in a drawer at UC Berkeley’s Lowie Museum for decades following his death in 1934. In discovering his own identity, Greg Sarris helped a scattered Indian tribe reassert theirs.